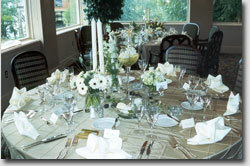 Heavy Hors d’Oeuvres – No formal seating arrangements allows for mingling and conversation; a casual yet elegant meal. Buffet Style Dinner – Formal seating (seating chart & place card option), with guests sent (club directed) through an elegant buffet to choose among many selections. Hosted Bar – “Open Bar” cost based on consumption. For available dates, menus and additional information call (706) 596-1100, email events1100@knology.net or complete and submit an Event Planner Form.